FIT-039 suppressed the replication of HSV-2, HCMV, and HAdVs. (A) FIT-039 suppressed the plaque formation caused by the HSV-2 infection in a dose-dependent manner. HSV-2 plaque reduction assay was performed in Vero cells treated with the indicated concentrations of FIT-039 and ACV. (B) FIT-039 suppressed the replication of HSV-2 genomic DNA in a dose-dependent manner. HSV-2 replication was analyzed by real-time PCR at the indicated concentrations of FIT-039. ACV was used as a positive control. (C) FIT-039 suppressed the replication of HCMV genomic DNA in a dose-dependent manner. HCMV replication was analyzed by real-time PCR at the indicated concentrations of FIT-039. GCV was used as a positive control. 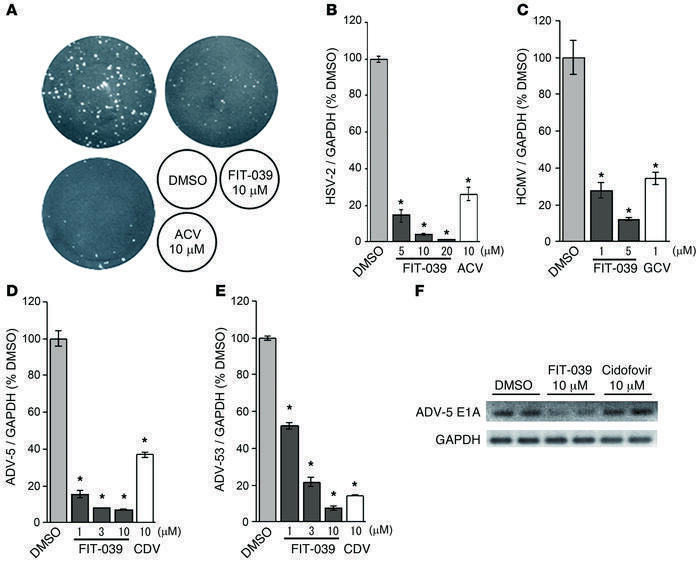 (D and E) FIT-039 suppressed the replication of HAdV genomic DNA in a dose-dependent manner. HAdV replication was analyzed by real-time PCR at the indicated concentrations of FIT-039 and CDV. (D) HAdV type 5 and (E) HAdV type 53 were examined. CDV was used as a positive control. (F) FIT-039 inhibited transcription of the HAdV gene E1A. A549 cells were infected with HAdV-5 and treated with FIT-039 at 10 μM for 6 hours. The cells were subjected to RT-PCR. In B–E, each point represents the average ± SD of the results from 3 experiments preformed in duplicate. *P < 0.001, versus DMSO treatment, Student’s t test.